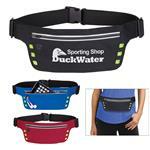 Our Hydrate Fitness Belt and Fanny Pack - a great sports waist pack. 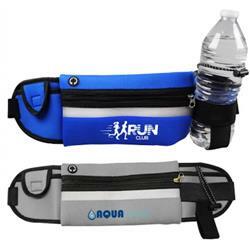 Neoprene fitness hydration belt with elastic compartment for water bottles. Zippered middle compartment measuring 7-3/4”w. Two side pockets, one with hook & loop closure and reflective strip and headphone port. This will holds most size water bottles. 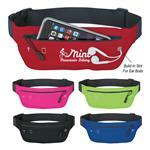 A great gift for runners and hikers.